Instagram has just announced 80 million users and a new app update; Noticeably missing in the update? The “Find Your Friends” on Twitter feature, which allowed users to follow the same people they follow on Twitter on Instagram. The “Tweet Photo” feature is still available. We’ve learned that the feature is missing due to API restrictions from Twitter’s end, restrictions that possibly came about over concerns about Instagram’s scale and its strain on data pulls. Many social apps like The Fancy and Foursquare still have access to this part of the Twitter API — it seems very likely that Instagram was the largest developer using the Twitter Friend Graph. The decision is especially perplexing for multiple reasons having to do with Valley politics: Twitter founder Jack Dorsey is also an investor in Instagram and the two companies share Benchmark as an investor. One could speculate that this is a competitive move on Twitter’s part, a direct attack on Facebook’s social graph via limiting access to its recent acquisition (Instagram). Twitter’s agenda here isn’t at all clear, but one possibility is that it wants to control the photos experience on its platform (and preclude Facebook from doing the same). Selectively limiting API access by company is definitely strange behavior in an ecosystem that thrives on API symbiosis. Imagine if Google just decided to shut off Google Maps access to apps randomly? Still, Facebook has done similar to Twitter in past years. 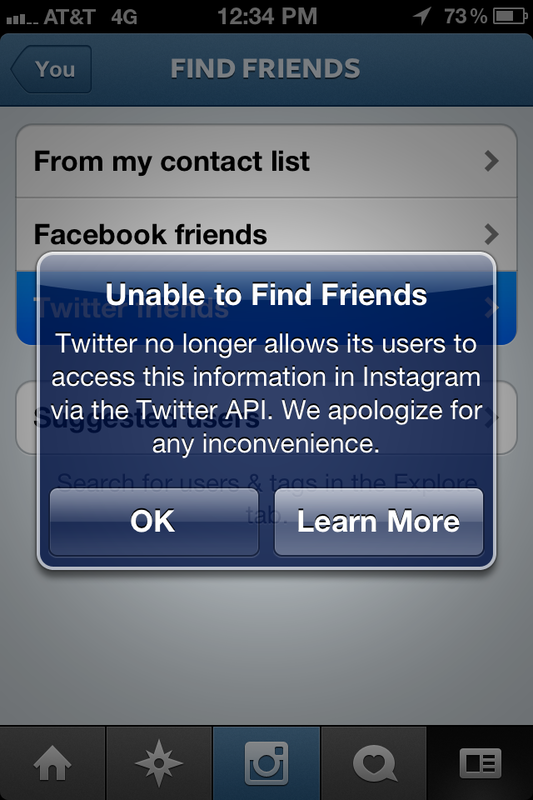 For example, it blocked Twitter’s access to Facebook’s in-app friend finder feature in June of 2010. Before this, Twitter’s most recent move in the API wars was pulling tweets off of LinkedIn, a decision that now seems like the beginning of a slippery slope.